Lake Chuzenji (中禅寺湖) is a highland lake located in Oku-Nikko, Tochigi. It is 25th largest lakes in Japan. Lake Chuzenji’s altitude is 1,269m and, as the natual lakes, it is the highest lake in Japan. Because of the high altitude, Lake Chuzenji is very cool even in summer and many people visit this lake to enjoy cool summer and camping. There are many restaurants and tourist attraction like boat riding or fishing. There are many waterfalls, including world famous Kegon Falls. 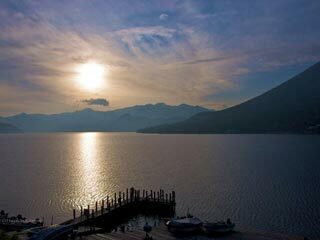 The scenery of Lake Chuzenji with Mt. Nantai is very beautiful. The Lake was found by a monk in 782. In 1876, Emperor Meiji visited this lake and named it “Sachi no Umi,” the Lake of Happiness.” Because it is very cool even in summer, many important people especially foreigners visited and built own secondary house around Lake Chuzenji.